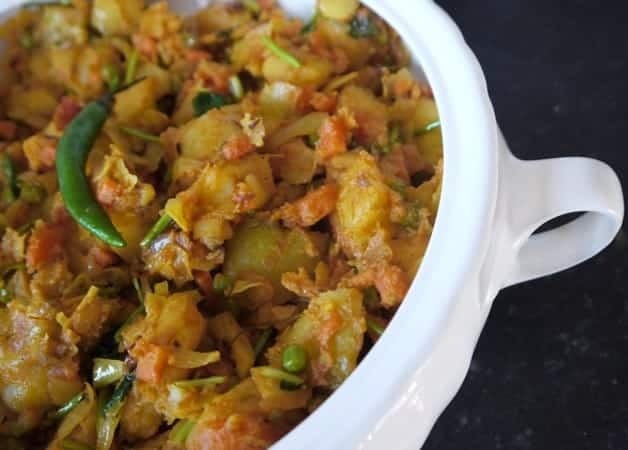 This is a great Punjabi recipe that is full of flavour, healthy and easy to cook. Typically eaten with chappatis, this dish goes down a treat with the little ones and adults alike! It’s also a fantastic way of using up vegetable you may have in the fridge. Heat the oil in non stick pan. Once hot add asafoetida, cumin and chilli and stir. When they begin to sizzle slightly, add the potatoes, carrots and peas into the pan. Cook for 3-4 minutes and stir continuously. Now add the fresh tomato and puree and mix well. Continue to cook for a further 2-3 minutes. Now add the cabbage and the remaining ingredients. Mix well and place a lid on the pan, stirring every couple of minutes. Cook for a further 5 minutes or until the potatoes or completely cooked (if a knife goes through the potato easily, it’s cooked).